This direct replacement Turn/Hazard flasher relay is modified to slow down your turn signal flash rate. With the Mustang Modified Flasher installed your turn signal sequence speed or rate will be longer and more pronounced. 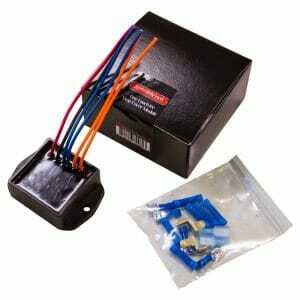 This direct replacement Turn/Hazard flasher relay is modified to slow down your turn signal flash rate. With the Mustang Modified Flasher installed your tail light sequencers will take longer to complete a sequence giving a more pronounced look. The AutoTrix modified Mustang Flasher will also work will LED bulb applications. This part will install in less than 5 minutes and has free US shipping. The AutoTrix modified flasher will work with any sequencer kit on the market; not just ours. Slows Flash Rate. Do you love the Sequential Tail Light kit you installed in your Mustang, but wish they sequenced slower? Well now you can slow down your turn signal flash rate with an AutoTrix Modified Turn Signal Flasher for true classic muscle car styling. Modern Electronics. The AutoTrix Modified Turn Signal Flasher is assembled from state of the art electronic components and is a direct replacement for your stock factory Electronic Turn/Hazard Flasher Relay. This module works with all brands of sequential tail light kits. Application. This Auto Trix Modified Turn Signal Flasher is designed to fit the 1996 to 2004 V6, GT, Bullitt, Mach 1 and 1996-1998 & 2003-2004 SVT Cobra Mustangs with a Sequential Taillight Kit installed. 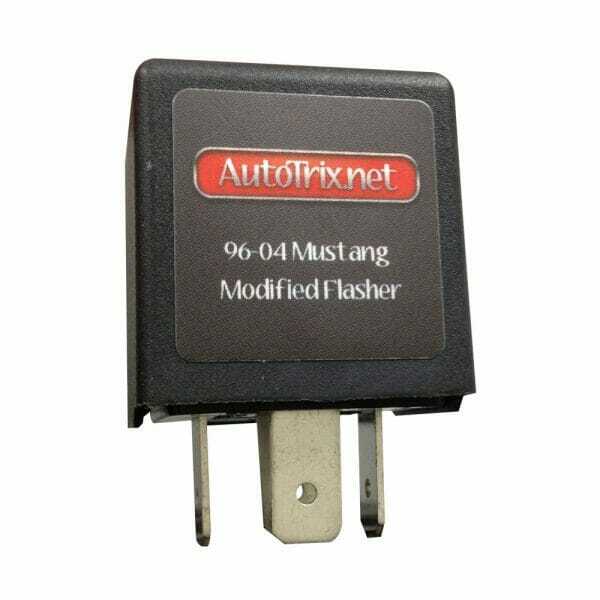 What Mustangs will the Autotrix Modified Flasher work on? The Autotrix Modified Mustang Flasher is a direct replacment for any 1996 to 2004 V6, GT, Bullitt, Mach 1 and Cobra Mustangs.